This article is about the recurring shark foe. For Mario's Cheep-Cheep partner from Paper Mario, see Sushie. For the Sushi character appearing in Mario Party Advance, see Sushi (character). 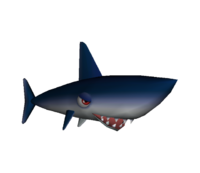 Sushi are a species of blue shark enemies found in several Mario games. They have navy-blue colored scales and a long pointed nose. Their name comes from the Japanese dish, sushi. A single Sushi first appears in Super Mario 64 and later in Super Mario 64 DS, inhabiting the beginning section of Dire, Dire Docks. The Sushi swims around in circles with no active intent to hurt Mario. However, Mario will get hurt if he bumps into the Sushi, and there is no way to attack it. Multiple Sushi appear in World 1-A from New Super Mario Bros.. They travel two at a time, swimming horizontally at different heights on the screen. They hurt Mario if they swim into him, but can be defeated with a fireball or by touching them while under the effects of a Super Star. In the Mario Party minigame Treasure Divers, a Sushi appears swimming from one side of the screen to the other, alongside two Bloopers. If it collides with one of the playable characters, it stuns them briefly, causing them to drop their treasure chest. 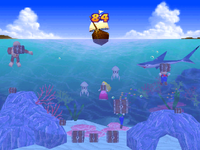 In Mario Party 2, one appears in Pirate Land, and will ferry anyone who lands next to the dock of one island to the dock on the opposing island, charging five coins per trip. 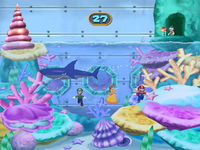 In Mario Party 3, a Sushi appears in Deep Bloober Sea, and is in charge of the torpedo controls. This Sushi will ask everyone who passes to push one of four buttons upon reaching a fork; one of them serves as the detonator, which will fire a torpedo when pushed, forcing the player to take the path they didn't select. A Sushi is also present in the minigame, Dizzy Dinghies. Two Sushi appear as obstacles halfway through the Manta Rings minigame from Mario Party 4, where they swim in circles around several bubble rings. Colliding with a Sushi deducts two points from the player. In Mario Party Advance, a Sushi lives at Sushi Cliff. In Mario Party 7, the 1-vs-3 minigame Be My Chum! involves the lone player calling out names of various enemies (including Sushi) on the Nintendo GameCube Microphone to attack the other players. The Sushi simply swims straight forward in a speedy manner. In Mario Party 9, Sushi only appear on the board Blooper Beach. They appear after the player runs into a Dolphin. They advance from behind the player, moving four spaces per turn. If they catch up to the vehicle, then the player loses half of his or her Mini Stars; it is then replaced by a Dolphin. If the player is near the first Boss Battle Space when a Sushi is the active fish, it swims away. Notably, Sushi are one of the few characters seen in the game that do not have a constellation based off of them. In Mario Hoops 3-on-3, the course Bloocheep Sea has Sushi swimming in the background. In Mario Kart Arcade GP DX, a large statue of a Sushi can be seen above the race courses Splash Circuit and Tropical Coast. Sushi can also be seen on signs in the background of Splash Circuit. Hōjirō From hohojirozame, "great white shark". This page was last edited on April 6, 2019, at 16:19.